A few years ago, similar to views about future electricity demand, forecasters thought gas demand in Australia would keep rising. As it turns out, gas demand peaked in 2012 and may halve by 2025 - as we showed in our recently published University of Melbourne Energy Institute (MEI) report, and earlier on The Conversation. 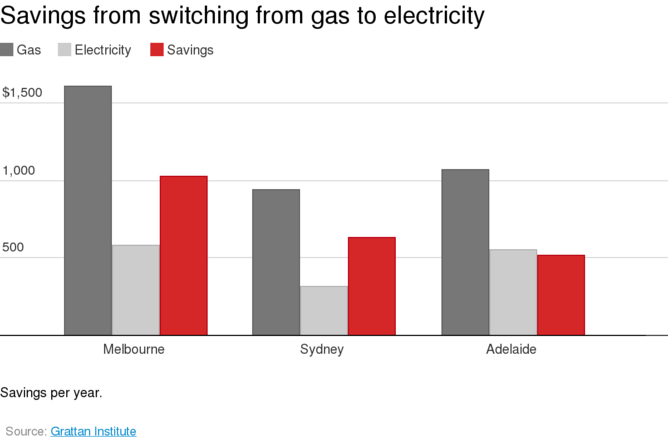 Step by step, householders are making economic decisions that will eventually lead to many completely disconnecting from the gas grid, as they find gas to be an increasingly costly secondary source of home energy. This is particularly true when it comes to space-heating. When the cost of operating a modern reverse cycle air conditioner (known in Tasmania and elsewhere around the world as a heat pump) can be one-third the cost of heating with gas, why wouldn’t a householder have a look at the possibilities? Another attraction is that heating with a reverse cycle air conditioner is largely renewable. Our research has quantified that reverse cycle air conditioners in Australia recover more renewable energy than do all of the millions of rooftop solar photovoltaic (PV) installations. Who knew? Previously we qualitatively described how in this “second electrification” of the Australian home, people will economically fuel-switch to induction cooktops, hot water heat pumps and reverse cycle air conditioners, resulting in their homes becoming gas-free. As shown in the following chart, the money that householders can save when economically fuel-switching from gas to electricity can amount to hundreds and even over a thousand dollars per year. 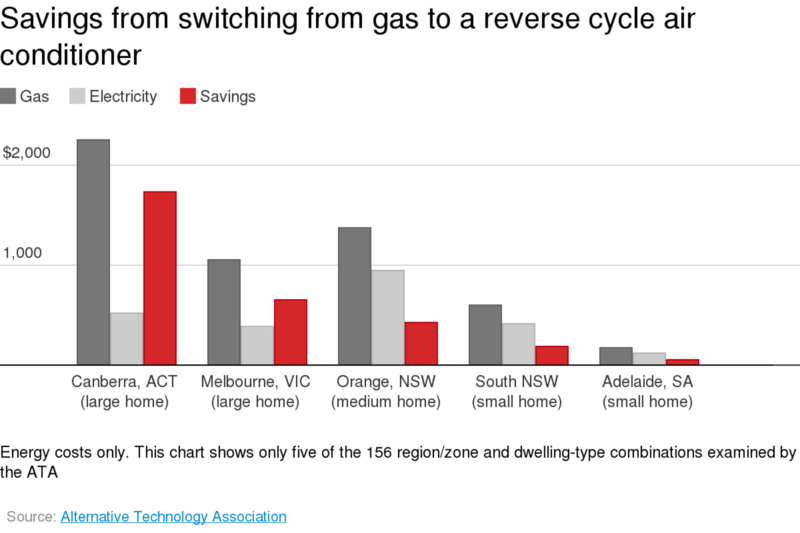 As shown in the following chart, analysis done by the Alternative Technology Association (ATA) indicates that using reverse cycle air conditioners to heat a large Melbourne home can amount to A$658 per year. But how is this possible? The biggest reason behind these new home economics is that reverse cycle air conditioners produce far more energy than they consume. Operating at efficiencies of up to 600%, they use a small amount of purchased electricity to capture free renewable heat from the outside air. For ducted gas heating, which can operate at efficiencies of less than 50%, the opposite is true. A ducted gas system will consume 34.02 megajoules of energy (including gas and electricity for the air blower)in order to produce just 10 megajoules of useful delivered heat. The rest of the gas energy purchased is immediately, in a sense, thrown away. This compares to an efficient reverse cycle air conditioner that requires only 2.55 megajoules of purchased electricity (the sum of the blue figures on the right) to extract an additional 9.53 megajoules of free, renewable, ambient heat from the air outside your house, and then produce the same 10 megajoules of useful delivered heat. In other words, in this comparison, in order to get the same amount of heat from a reverse cycle air conditioner, the householder must purchase only 1/13th of the energy needed to operate ducted gas. This efficiency advantage wipes out the traditionally lower cost of gas energy versus electrical energy when those commodities are compared on a dollar-per-megajoule or per-kilowatt-hour basis. What do 'Star Ratings' mean? With the increasing emphasis on energy efficiency, the star rating of any appliance has become the dominant factor when considering a new air conditioner purchase. The assumption is that the more stars a product has, the less energy it will consume. In fact the governments' own website states "the more stars the more savings". To determine if this is in fact the case we must first consider how these star ratings are calculated. The star rating labels on modern air conditioners will have a star rating for cooling and another for heating. The basis for these ratings is the energy consumed to perform each process. In cooling the EER or 'energy efficiency ratio' is used. This is simply the output divided by the input. For example if your air conditioner has a 6KW (6000 watts) cooling capacity and an input of 1.5KW (1500 watts) then the EER is 6 divided by 1.5 equals 4. In heating, the COP or 'co-efficient of performance' is used. This is more difficult to explain however an attempt is made in the article "How does an air conditioner work? in this blog. Now if maths calculation alone were used the star rating would be a reliable reference, but a 'lab testing criteria' is included which can significantly alter the outcome. This is because of the special features included in some products greatly alter the efficiency measurements. So lets look at a few of these features and you'll see what I mean. An inverter compressor can produce 110% of its stated capacity. In other words a 5KW product can actually produce 5.5KW. Some manufacturers have taken to limiting the range to the stated capacity and thus reducing the effective size of the air conditioner. The reason for this is to remove the extra power required to achieve this extra 10% and appear to consume less energy for the same rated size. Of course you're actually paying for a smaller product with an often greatly inflated price. My favourite is the intelligent eye. One of the functions of this is to detect when there has been no heat source in the room for twenty minutes and switch to economy mode. Some models warn that this sensor can mistake pets for humans, can in fact mistake any heat source for a human, and can fail to recognize an actual human if they haven't moved for a while. A little advice here is that if you have one of these sensors on your bedroom unit be sure to wake up every twenty minutes and wave, just to let the air conditioner know you are still there. A variant of the intelligent eye is the sunlight sensor. This claims to detect the intensity of sunlight, from this calculate the temperature and adjust accordingly. If it doesn't detect sunlight it assumes it is dark or cloudy. Got that? Economy mode has no universal meaning other than 'more economical than before'. One variation alters the set-point upwards 2 degrees Celsius (in cooling mode) thus consuming less energy. Another runs the unit at a reduced cooling capacity regardless of the room temperature. In other words you can set the temperature to suit you, or you can let the machine set the temperature to save power. Do more stars mean more savings? In a nut shell...it depends. A recent CSRIO study into building energy efficiency ratings found that 31% of all energy consumed by residential air conditioners in Queensland was by letting the timer function turn the unit on and off automatically. A recent trend is to incorporate wireless connectivity to allow remote control via smartphones. This can only increase this wasted cooling energy. A correctly sized air conditioner does not need to turn on before you get home. An obvious impact on efficiency is whether the special features that you are paying for are things you will actually use or need. In other words... buy the air conditioner with the features you will actually use and then use them. Air conditioner performance is based on EER and COP figures. These are the numbers you should be looking for when considering efficiency ratings. Star ratings are influenced by special features. Consider whether you will use the special features. If not, the number of stars is meaningless. Stars cost money. Beware inexpensive units with many features and high star ratings. Star ratings are designed to assist you choose a unit. The real energy savings are through intelligent use. Relative humidity is the most common term used to describe the moisture content in the air. The key to understanding relative humidity is to understand that the term means 'actual humidity' relative to the maximum humidity at a given temperature. Lets expand this a little. The capacity for air to hold water increases as the temperature increases and decreases as temperature decreases. If we think of air as being like a big sponge that soaks up a fixed volume of water it is easy to see a point at which the sponge can no longer soak up any more water. This is known as saturation point and is 100% relative humidity. Now if we double the size of the sponge but retain the same amount of water our relative humidity is now 50%. Temperature has the same effect on air. As air temperature increases relative humidity decreases. Relative humidity is therefore a measure of actual water content relative to the maximum water content of air at a given temperature. The refrigeration or air conditioning process is something that most tradesman come to understand over many years while measuring temperature and pressure, electrical current and timing cycles while staring thoughtfully at a piece of machinery wondering 'what is going on in there'. There are however some simple points that will help explain the fundamentals of the process. I will relate this to a standard home split system to make the information more accessible to more readers. The diagram below is a standard illustration used to aid this explanation. A few things we need to know before we begin are that first and foremost, temperature and pressure are closely related. As temperature rises so does pressure, as pressure rises so does temperature. The second point is regarding the curved line on the diagram. This is know as the saturation curve and refers to the state of the refrigerant. Refrigerant has two possible states which are vapor or gas, and liquid. It is enough to know for this discussion that the area area inside the curved line is a blend of vapor and liquid with somewhere between 0-100% of liquid. The area outside of the curve is pure vapor. So what happens when an air conditioner is cooling your home? The evaporator, or indoor unit must always run. The modern condenser, or outdoor unit contains all the other components required for the cycle. Starting from the compressor, refrigerant vapor enters the compressor (1) and is compressed resulting in an increase in heat and pressure. This hot, high pressure gas then enters the condenser coil which is the copper and aluminium structure usually located on the building side of the outdoor unit. A fan then pulls air across the coil resulting in a temperature decrease in the refrigerant. As the refrigerant continues to travel from right to left on the condenser line on our diagram it changes state and continues to cool until it reaches the expansion stage. Expansion is most easily understood as a method of rapidly decreasing pressure. This can be achieved by simply increasing the size of the copper tube that the refrigerant is travelling in at the point you wish to decrease pressure. In practice this is a precise and often complicated process. Expansion decreases the pressure and temperature of the refrigerant before it enters the evaporator in a low pressure/low temperature state (usually around 6 degrees Celsius). This is where the cooling begins. The warm air inside your home is then pulled across the coils containing the cool refrigerant and the heat is transferred into the much cooler refrigerant. The cooled air (usually 12-16 degrees) is then returned to the room much to the appreciation of the occupants. The refrigerant then continues on to the compressor and the cycle commences again. One of the energy star ratings you will find on a new air conditioner for heating is determined by the "COP". This is literally the coefficient of performance. There are ways of calculating this figure using energy consumption however the method I've always used is using the diagram above. If we look at the evaporator line from the left at (5) until the point at which the saturation curve intersects, this is known as the 'refrigeration effect'. The line between the compressor (1) and the top of the compression cycle (2) is called the heat of compression. To get these figure simply measure the temperature in degrees at each point and determine the respective temperature ranges. If we divide the refrigeration effect by the heat of compression we are left with the COP. The other energy star rating you will see relates to cooling mode and is known as EER or Energy Efficiency Ratio. This is simply the amount of output energy divided by the input energy. For example if you have a 6KW unit and the input rating is 1.5KW then your EER is 4. The figures to calculate the EER are usually available on the appliance sticker or nameplate on the outdoor unit. The small area on the evaporator line that precedes the compressor is known as the suction super heat or SSH. This ensures that any refrigerant that enters the compressor is not in liquid state as this would likely destroy the compressor. The standard SSH is 6-7 degrees Celsius. You may also notice that the diagram shows the refrigerant to be a vapor when entering the expansion stage. In practice this not the case as expansion devices are much more stable when the refrigerant is a liquid. Remember...only a fully qualified air conditioning and refrigeration tradesman understands your air conditioner. Aspect. Where possible locate your unit away from the afternoon sun. This is because the efficiency of your air conditioner is effected by the air temperature at the outdoor unit. The installation pictured is located on the western wall which means it gets the full impact of afternoon summer sun and will result in a reduction in efficiency. This should be avoided wherever possible. Noise. Modern air conditioners are becoming increasingly quiet but still produce mechanical noises that are clearly audible if located poorly. For example in the picture, the occupants of the house on the left would hear almost no noise from their own air conditioner while their neighbours, just out of picture on the right, would hear a lot. A sure fire way to upset the neighbours for a long time to come. Accessibility. Many air conditioning installers will recommend the location that allows them to provide the cheapest quote. However, should you have a warranty claim against the manufacturer within what is normally the five year warranty period, they will demand easy access. While this is a fairly flexible term, if the manufacturer deems that your unit does not have easy access they will charge you for all costs incurred for access and in some cases refuse service altogether. It is a good idea to avoid placing units at heights on sloping ground to avoid this problem. Aesthetics. Air conditioning units last for a long time and so due consideration should be given to their placement. Many home owners go to great lengths to build decks, paint eaves and trim hedges...only to plonk an air conditioner in the most conspicuous place possible. Unfortunately that shiny new unit might not look so impressive in five or ten years time. Water/summer.This is the most neglected element of home air conditioning installations. An air conditioner of the size pictured can remove up to 3 litres of water per hour from your home. Great news for your home but where does this water go? In most cases this is fed through a pipe to spill out near your outdoor unit. That means that maybe thirty litres of water per day is dumped somewhere near your foundations or footings. It also provides a constant source of water for many pests including termites and wasps. There are not always simple solutions to this problem. In our example the water could easily have been directed into the storm-water down pipe. At the very least water should not be allowed to gather near your building. Why not direct it into a garden? Water/winter. In winter the outside unit condensates. While the amount is much less than the amount produced during summer it can never-the-less create some issues. If your outside unit is located on a bracket above public access it can cause slippery surfaces as well as dripping freezing water onto people. If your unit is located on a deck the water can rot the timber. For these reasons units come with the option of plumbing the outside unit in much the same way as the indoor unit. This way water can be directed to a more suitable location. The image on the right shows a Mitsubishi unit installed by us in a commercial area. Note the plumbing on the outside unit. Unfortunately none of the nearby units are afforded the same respect resulting in an often slippery surface through the winter months. Placement of your air conditioner's outdoor unit is something to consider and discuss with your installation team. See what you are getting for your money. The cheapest quote may mean you are not getting the best option. Intelligent placement can make your unit run more efficiently, improve the look of your house and reduce the risk of repair bills. Moving your outdoor unit after your initial installation can be expensive so it makes sense to give some thought to placement beforehand.